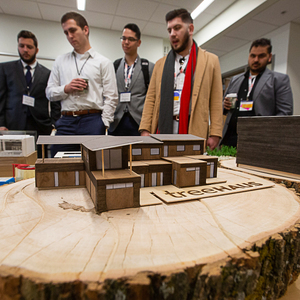 Construction began last summer, and now this luxury home is getting ready to go on the market and become certified by Passive House Institute U.S. High-end PH near D.C. Built to perform to the Passivhaus standard, this house in Bethesda, Maryland, is nearing completion, and installation of the porch decking under way. It is a high-end project, with five bedrooms and four-and-a-half baths. Project Architect David Peabody said 3,600 sq. ft. of interior space was used for Passive House Planning Package calculations, although the building is actually 4,318 sq. ft. when its finished basement and attic are included. 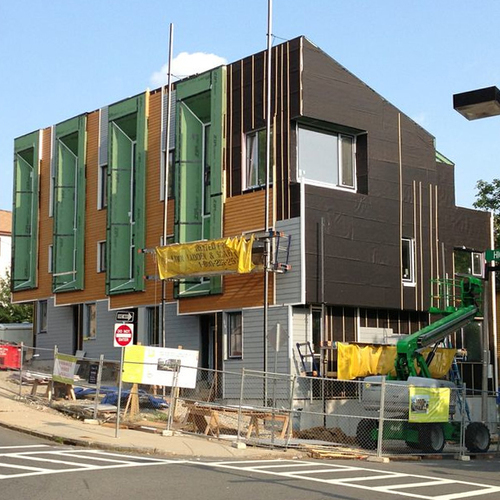 Image Credit: Peabody Architects and O’Neill Construction Structural insulated panels where used for the exterior walls and roof. After they were in place, the construction crew taped the interior corners (before installing timber for the drywall) but not all joints and seams. The construction team wanted to conduct a preliminary blower-door test to verify how effectively the SIPs seal by themselves. After the taping was completed, a second blower-door test was conducted to determine the percentage of added benefit. The joints for this hip dormer were filled with expanding foam that was later rasped smooth. The joints were then covered with SIP tape. The perimeters of all windows and doors were dressed with a layer of high-density extruded polystyrene foam as well as lumber. The building’s “outsulation” consisted of two layers of EPS foam whose staggered sheets were screwed in place. House wrap and vertical strips for the siding were installed over the foam sheets. Looking toward the front the house from its dining area. 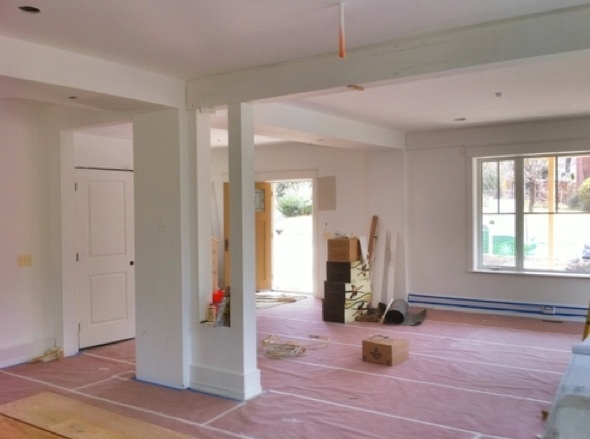 In October, when we last checked in on the New American Foursquare, a Passivhaus project in Bethesda, Maryland, the foundation was already in the ground. 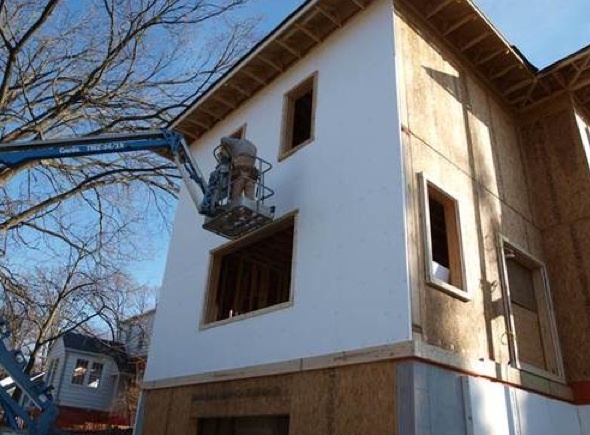 Passive House Institute U.S. director Katrin Klingenberg had stopped by the jobsite an offered a suggestion for airsealing the foundation perimeter, and a crew of specialists in structural-insulated-panel installation would soon get to work putting up exterior walls. The project is now in the finish-work stage and has been put through a couple of preliminary blower-door tests to track down air leaks and affirm that the house is sufficiently airtight. The first test showed about 0.67 air changes per hour at 50 Pascal pressure difference. 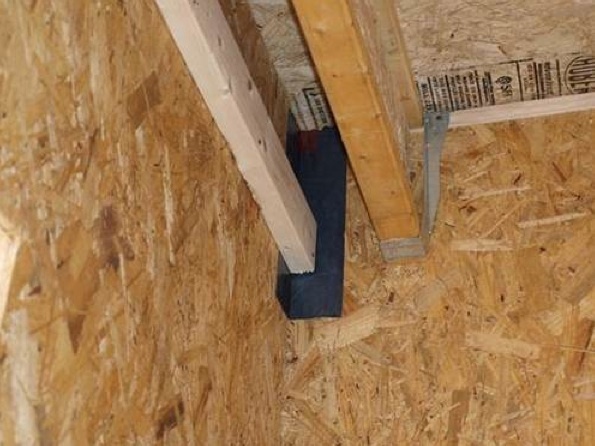 The second test, conducted before drywall and trim were installed, showed 0.59 ACH, which meets the Passivhaus airtightness requirement. At 4,318 sq. ft., with five bedrooms, four and a half baths, and a finished attic and basement, this house is being presented by the project principals – O’Neill Development and Peabody Architects – as a prototype that can be replicated in several sizes and less-costly configurations. The strategy is to offer plans for American foursquare homes in sizes ranging from 2,400 to 4,400 sq. 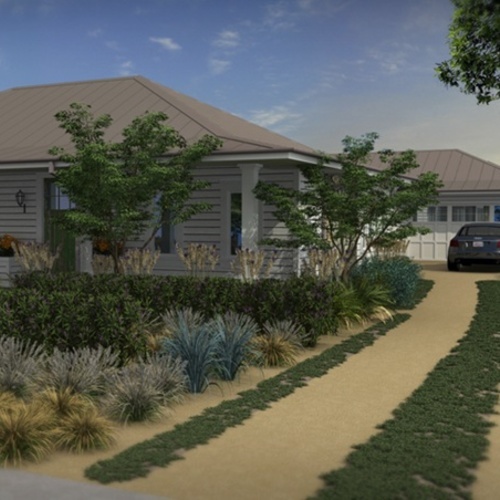 ft., and homes built in a Craftsman cottage style from 1,500 to 2,500 sq. ft. 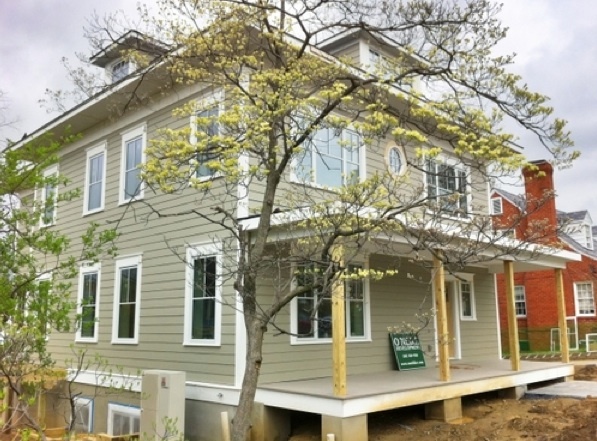 The New American Foursquare prototype is located in a Bethesda neighborhood that, even by the standards of the Washington, D.C. metro area, is relatively pricy. The home’s listing price is expected to be $1,688,000, but the partners hope to accommodate far smaller budgets with many of the replicas. The home’s exterior walls are built with 8-in. 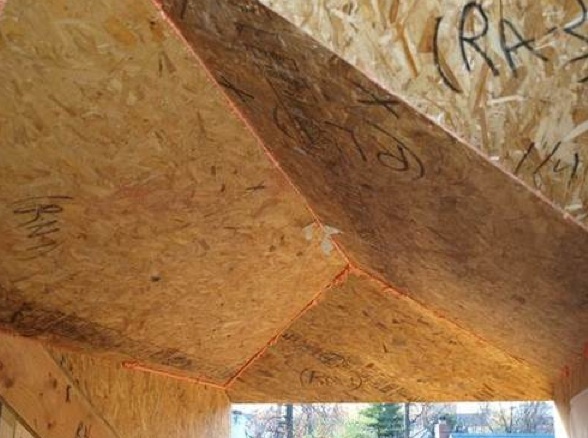 InsulSpan SIPs covered on the exterior with two staggered layers of expanded polystyrene (1 3/4-in. 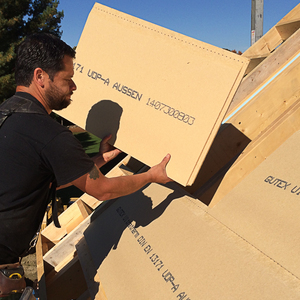 thickness total), bringing the total thermal resistance of the wall assembly to R-36. 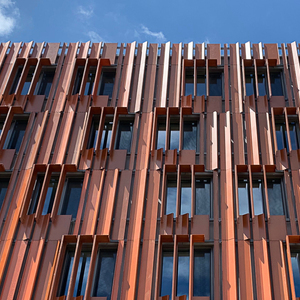 The foam sheets were covered with Tyvek housewrap and vertical furring strips to create a rainscreen; the siding is HardiePlank fiber cement. The roof was constructed with 12-in. SIPs, with standard asphalt shingles over felt, for R-45 thermal resistance. Foundation walls are insulated to R-44 with 4 in. of EPS on the exterior and 5.5 in. of fiberglass on the interior, while the concrete slab, at R-20, has 4 in. 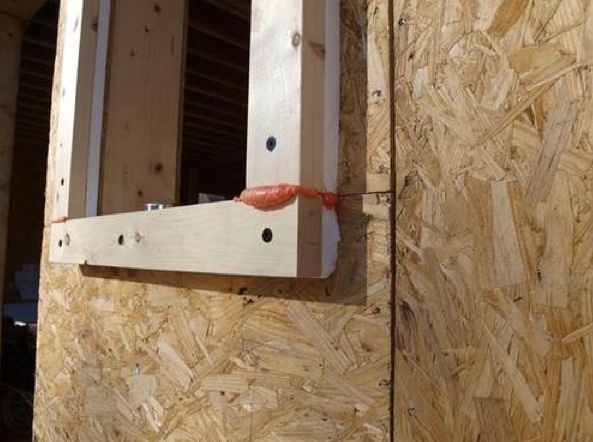 of EPS with a vapor barrier underneath. The house is equipped with two Zehnder ComfoAir 350 energy-recovery ventilators, one for the attic and second floor, the other for the basement and first floor. A hot-water line from the home’s gas boiler runs to a heat exchanger downstream of each ERV unit. The boiler also supplies hot water to a Weissmann insulated tank with an integral solar heat exchanger, although installation of solar collectors will be up to the homeowner. A 36,000 BTU Mitsubishi ductless minisplit air-source heat pump will assist with cooling and dehumidification. 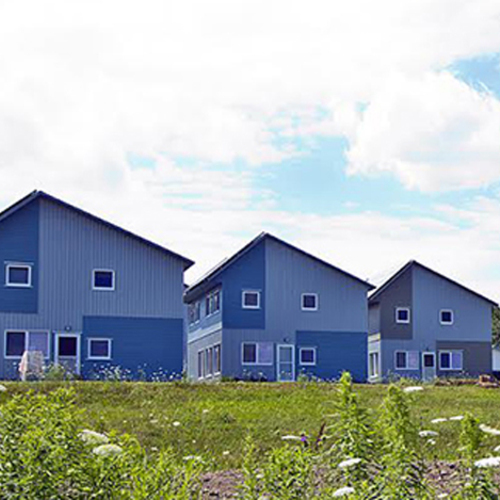 Bringing the home to the Passivhaus performance standard added 8% to the project’s construction costs, according to the project partners. The annual energy bill is expected to be about $2,400, although the usage habits of the occupants will obviously come into play. 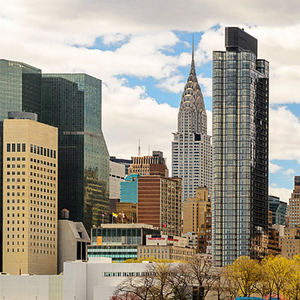 Still, architect David Peabody points out that only about $600 – or 25% – of the estimated annual energy bill is likely to be for heating and cooling. The exterior insulation was EPS not XPS. The staggered sheets were a standard 1pcf density while the layer behind the window wrap was a 2pcf density. The blower door numbers were personally very disappointing. However, when you look at the fact that three of the Thermotech units were missing glazing (plywood insert waiting on delivery), and the ill-fitting doors (light can be seen coming through the door seals) I'll have to wait patiently for the final test. I very much appreciate the follow-up. The correction has been noted and applied to the text. 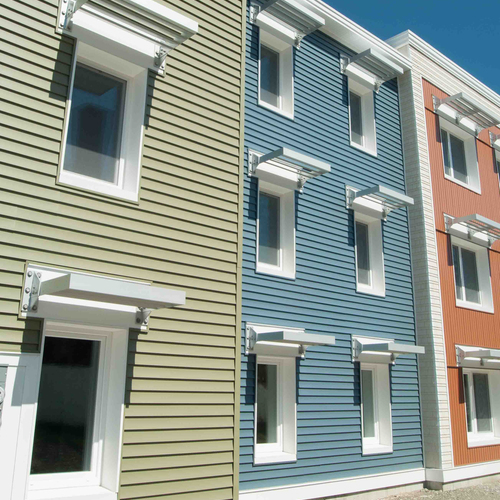 The First Passivhaus Retrofit Certification in the U.S.